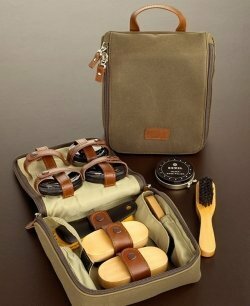 Why is a shoe shine kit a valuable gift? It has often been said that you can tell much about a person by looking at their shoes, not whether they are rich or poor, but whether they take pride in themselves and in their work. In other words, it is not the quality of the shoes that makes the professional, but the quality of the care he or she gives their shoes that characterizes them. This footwear care kit features a shoe horn, soft cloth, brush w/handle, 2 hand brushes, both black and neutral polish, and even 2 travel size polishes in separate packaging. Choose this premium care collection for recognizing the professional who always makes certain to deliver the right impression. This set is great for traveling Bag is 7" Tall by 6 1/4 Wide. Made in China. If you have any questions about this product by Bey-Berk, contact us by completing and submitting the form below. If you are looking for a specif part number, please include it with your message.